In the 1960s a new practical, functional site for the science faculties of Groningen University was built to the north-west of the city centre. Besides faculty buildings it includes some higher professional education institutions and a sports complex. West 8, entrusted with revitalizing the university's Zernike Campus, sought to make it an open green landscape dotted with autonomous buildings of distinction. 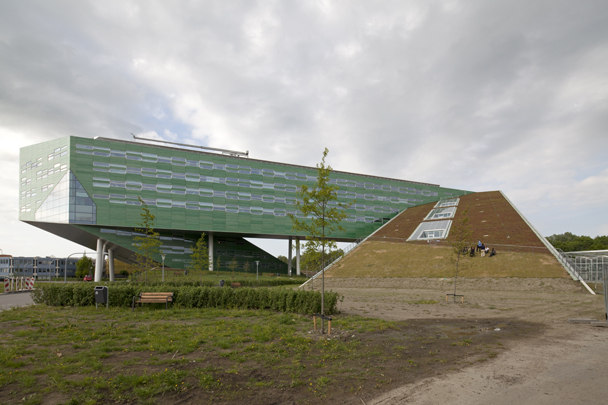 Three institutes for life sciences have been housed together in a building by Rudy Uytenhaak that rears up out of the landscape with animal houses to one side and greenhouses and test beds to the other. It has glass-reinforced polyester cladding emblazoned with a graphic pattern.